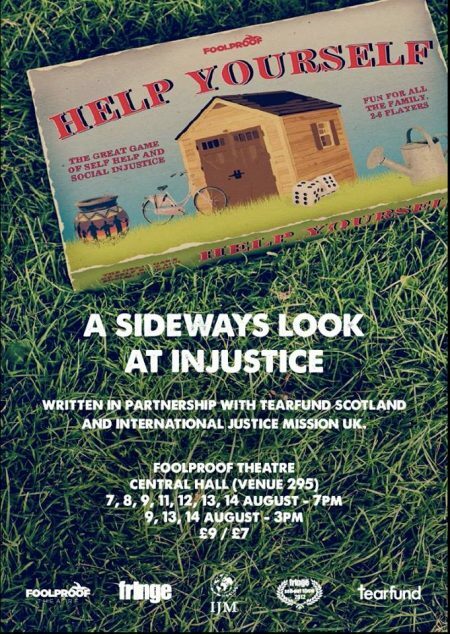 ‘Help Yourself’ was written in collaboration with International Justice Mission UK and Tearfund Scotland in 2014 for performance at the Edinburgh Festival Fringe. With the support of a grant from Christian Arts Trust we then adapted the script and performed the production as part of the Just Festival and the Edinburgh Festival Fringe in 2015. The production used real life stories, slapstick comedy and a fictional account of a family at war to examine the responsibility of the individual as a global citizen. Topics covered include land-grabbing, gender inequality, human trafficking and homelessness under the broad headings of poverty and injustice. We worked with a cast of three young actors and a trainee assistant director to stage twelve well-attended performances in August 2015. We intend to revise the script again and to tour the production with a package of classroom resources to Scottish secondary schools in Spring 2015. Foolproof Creative Arts is a Scottish-based company which aims to encourage creativity and promote community. We are an unashamedly Christian company, but work with people of all faiths and none across a range of artforms. We work primarily in theatre and run a range of projects including Grassroots Theatre, a drama project for people at risk of social exclusion and homelessness; an after-school drama project for primary school children; a gap year scheme for young Christian performers; and two residential drama weeks for young people. Our drama team and individual actors are available to perform in schools, churches and community settings. We write theatre that provokes, entertains and challenges people to examine their beliefs and values. Foolproof’s Creative Director is Fiona Stewart, an actor, writer and director. Fiona worked with SU Scotland for 10 years as a youth worker before training as an actor at the Mountview Academy of Theatre Arts in London. She then worked for the Damaris Trust as a Managing Editor and video maker before moving back to Scotland in 2008 to establish Foolproof. In 2015 she is relocating to Glasgow where she will continue to head up the work of Foolproof alongside leading a missional community. Foolproof recently appointed Philip Todd as an Associate Artist to lead the work in Edinburgh. Philip trained at the Royal Conservatoire of Scotland and Central School of Speech and Drama.